Traditionally, cyber-physical systems designed for home and building automation, energy management, surveillance, e-Health, and electric-vehicle charging have been self-contained and unable to interacted with other systems. SMLC is widely recognized for its commitment to the transformative potential of Smart Manufacturing and substantially lowering the barriers to extensive deployment of Smart Manufacturing (SM) systems. Two Detroit-based technology start-ups, Nextek Power Systems and TOGGLED, have developed a modular, scalable low voltage power and lighting system that allows facility managers to rewire and move lights as building needs change – more safely and cost effectively than conventional systems. The potential of Smart Transportation Systems (STS) is enormous: improvements in travel time and road safety, reductions in congestion, and improvements in the performance of the road system and fuel efficiency can easily be translated into economic benefits. Heating Ventilation & Air Conditioning (HVAC) consumes up to 40% of commercial buildings’ energy. Daikin is supplementing their DoE energy efficiency award-winning rooftop units (RTU) with an advanced energy sensor and intelligent wireless gateway from Intel, attached to each HVAC RTU for buildings on a given campus. Smart Shape Technology (SST) completely disrupts current supply-chain channels, where today a consumer or manufacturer may only have one channel to gain visibility and to procure parts/products. 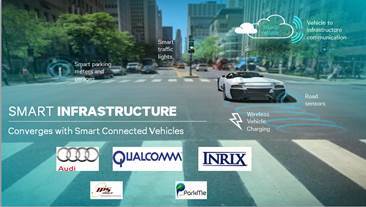 With integrated communications increasingly installed in both private and public vehicles, automobiles are providing a level of insight into transportation operations as well as setting the stage for enabling intermodal transportation concepts that will make more efficient use of transportation infrastructure in the future. When disaster strikes, the smartphone in your pocket should be a powerful ally, helping you locate resources, navigate to safety, assist others, and maintain contact with loved ones. Like cell phones, vehicles will connect to multiple data services, including cellular, wi-fi and DSRC (digital short range communication). The Agile Fractal Grid is a combination of the Industrial Internet operating in tandem high performance computing and a new generation of digital controls that can operate the grid with greater agility, real time precision, and dynamic alignment with changing local conditions. The electricity system continues to transform from a centrally supplied and managed infrastructure to a highly distributed system with an increasing variety of distributed supply, storage and responsive demand assets. Connect multiple test beds within different M2M verticals, to create a secure and flexible infrastructure where things can exchange information.